I always love Rae’s fabric designs. They are so bright, colorful, and perfect for kids (or the kid at heart.) This collection is printed on interlock knit, which is really stable and easy to work with. It is a great starting place for someone who is new to sewing with knits since it doesn’t shift around or curl up at the edges. It is also really soft and so nice to wear! When I got this yardage of Rae’s Fancy Steps print I thought for a minute about making something for Caroline. She would have been so adorable in this fabric, but I decided that it would be way more fun to make something for myself. 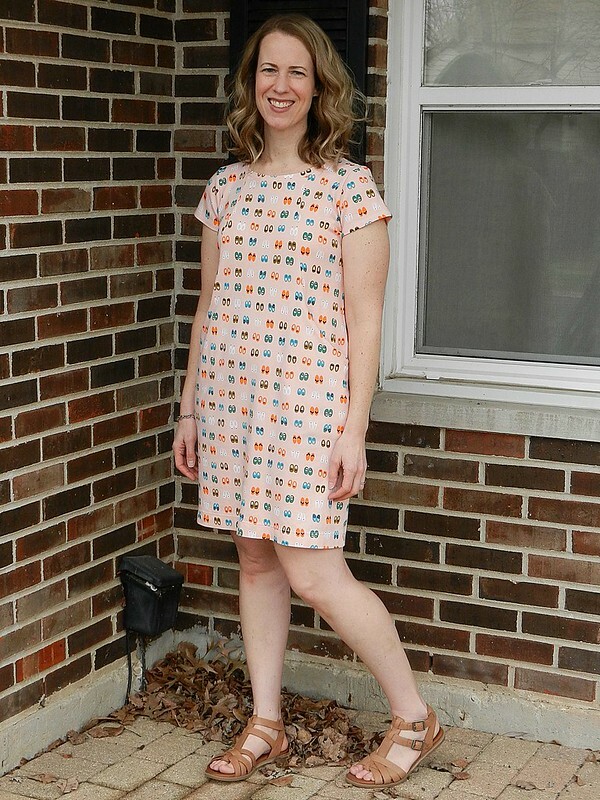 I had just recently purchased Sew Over It’s Heather Dress and one of the recommended fabrics is interlock. I absolutely love the short sleeved, pink and white striped version of the dress that they show in the pattern listing and I wanted to make a similar dress. I had two yards of the knit and it was just enough to make the short sleeved version of the dress. I did my best to line up the rows of shoes across the princess seams and side seams. It’s not perfect but I don’t think it needs to be with a whimsical print like this. My measurements put me between the size 10 and 12 at the bust and between the size 14 and 16 for the hips. I made the 12 graded to the 16 but it ended up being a little loose through the hips so I trimmed it back down to the 14. The dress fits exactly how I was hoping. It’s slim-ish, but certainly not tight. I think it will be so perfect for our hot Summer weather when I want something that skims but doesn’t cling to me. I love the style lines, especially how the princess seams form those giant front pockets. The fabric is so fun and will be perfect with sandals or flip flops! I really wanted to keep wearing this outfit after we took pictures but it was 40 degrees outside and I would have needed tights, boots, and a cardigan. I will be counting the days until the weather is warm enough to wear this exact look! p.s. Thank you to Rae and Cloud9 for providing me with yardage to sew the project of my choice. All opinions are my own. Gah I love this!!! You look absolutely adorable. 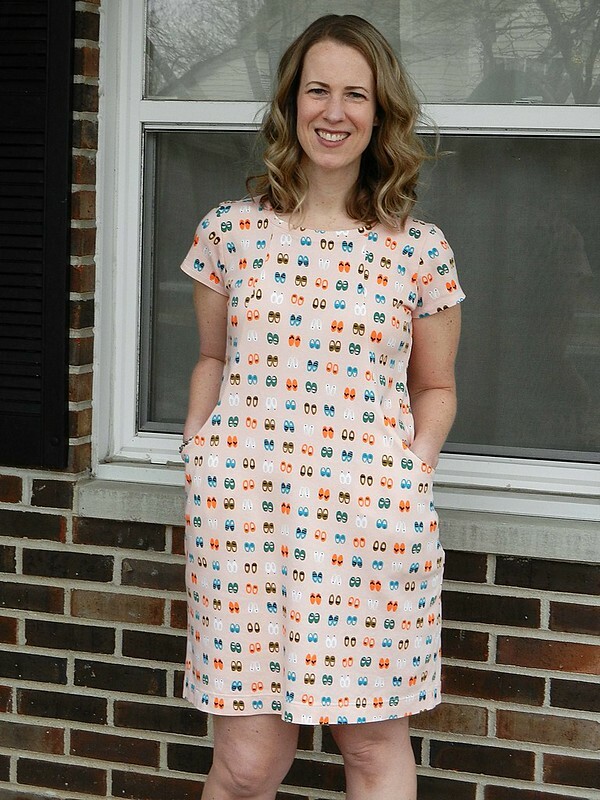 I love those pockets — what a great pattern!! Thanks, Rae! I really love how the dress turned out. I can’t wait for Spring so I can wear it without a zillion layers! Cute! That looks like a great dress to throw on this summer. Thanks, Masha! That’s exactly what I thought. I can’t wait for the Summer weather to come! This looks awesome on you Teri! I agree, it’s going to be perfect for summer!